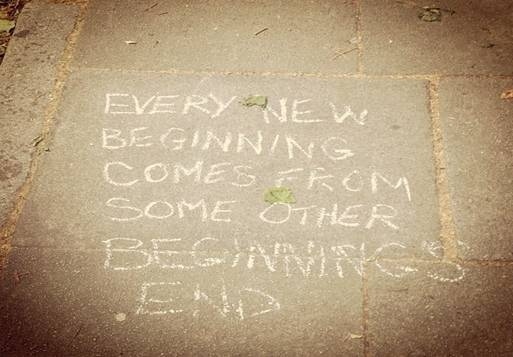 My friend emailed me this picture she’d taken today of an inspirational quote she’d found chalked on the pavement of a central London square. I love a good profound quote and think there’s something quite beautiful about stumbling across them in the way that she did. It always makes me think abut not only the meaning of the words, but also who may have written them and why. I like this quote as it is a good reminder that change is a good thing and that opportunity is all around us, and whilst good things must come to an end, it’s only so that new good things can start. Previous Post 30 Day Snap Challenge | Day 20 – Birthday Cakes!